Sometimes we don’t know how well we have it. While living in a world of Twitter trends and the latest celebrity gossip, it’s often hard to appreciate the suffering that comes from growing up in dire poverty, or the fear that comes when one’s life might well be threatened. Such things, we might well feel, are only the stuff of movies, right? 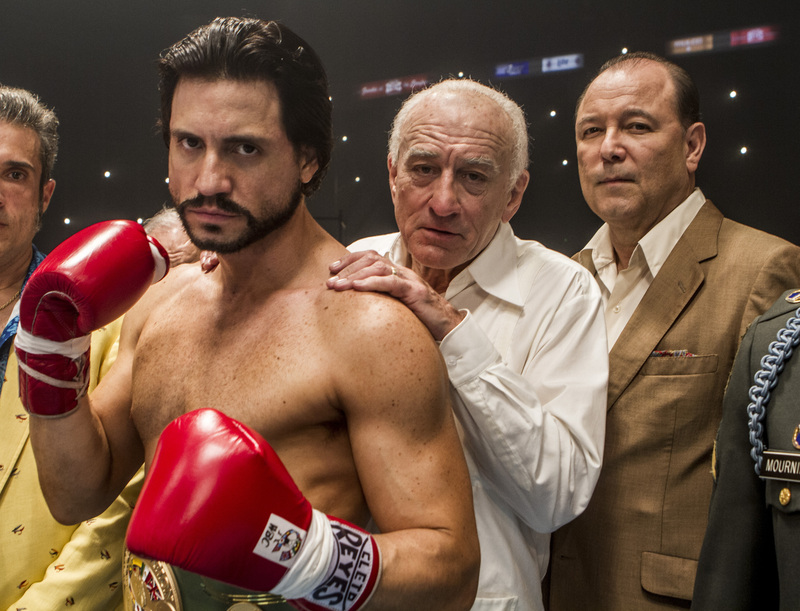 While the upcoming film “Hands of Stone” deals with the relationship between Panamanian boxing legend Roberto “Hands of Stone” Duran – played by Argentinian actor Edgar Ramirez – and American trainer Ray Arcel – played by Robert DeNiro – it’s worth keeping in mind that the film is based on a true story. For the real Duran grew up in grinding poverty in his home country, while Arcel had legitimate reason for fearing the mafia would kill him. It’s actual life the movie deals with…though the story itself is custom made for Hollywood. “I was fascinated by him,” the director stated about his subject, “by his style, by everything he represented.” Yet Jakubowicz, who burst onto the scene with 2005’s “Secuestro Express” made it clear Duran “wasn’t a saint.” Sure enough, Duran was apt to make things as difficult for the “Hands of Stone” team as it was for his trainers during his prime. Sure enough, the dire poverty of Duran’s youth helped shape the man. Jakubowicz explained how, as the extremely poor Panamanian son of an American Marine who abandoned his paternal obligations, Duran felt the sting of American influence, as well as an individual American’s neglect. Still, the director made it clear that America also provided with fighter with incredible opportunity, especially through the person of Ray Arcel, who’s played by Robert DeNiro in the film. “That dichotomy I found extremely fascinating,” the director said. What may be extremely fascinating to film and boxing fans is the film’s cast. Besides Ramirez, who was brilliant in 2010s “Carlos,” Robert DeNiro, famous for, among other things, the fight classic “Raging Bull,” proved to be extremely helpful. As Arcel, he plays an aging trainer who comes back to the fight game after being run out of boxing years earlier by the mafia. Yet DeNiro wasn’t the only big name to come aboard. Someone was needed to play Duran’s arch nemesis, the popular and masterful “Sugar” Ray Leonard. Needless to say, Leonard the character was as difficult to cast as Leonard the fighter was difficult to defeat. Jakubowicz was bewildered. “I met with Freddie Roach,” the filmmaker said. “He goes, ‘listen, for Sugar Ray, you should get a dancer.’” That may have seemed crazy, but Jakubowicz took the iconic trainer’s advice. The role went none other than pop icon Usher – who’s listed in the film as Usher Raymond IV. It was obvious just talking to the director that he was a true fan of the sport of boxing. “It’s a labor of love,” he said of the film, adding that “the golden era of boxing” that Duran and Leonard ruled, deserved top notch treatment. After all, these were men who went for broke – repeatedly. And frankly, it’s a story that’s needed to be told on film. “We really need everybody to go,” Jakubowicz said. Undoubtedly many fight fans will heed the call. “Hands Of Stone” opens nationwide on August 26th.